Denver, CO — This morning, January 11th, a Rescue Mission employee was caught on camera trashing homeless people’s blankets and tents and threatening to “Burn Them.” This morning it was 30 degrees and snowing and will continue to snow all day – leaving all whose property is now trashed in the cold with nothing to cover from the snow. 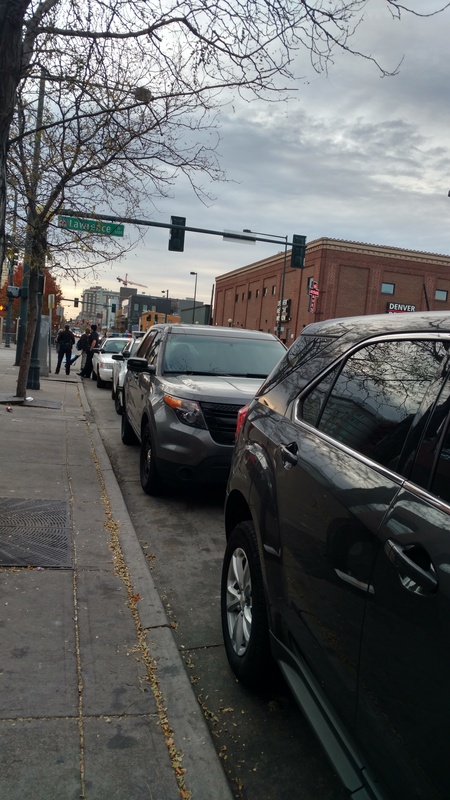 Thousands of people live on the streets of Denver every night – even in the cold and snow. Gear like blanks and tents are not a choice in this weather, they are the means of survival. This insane inhumanity must end. 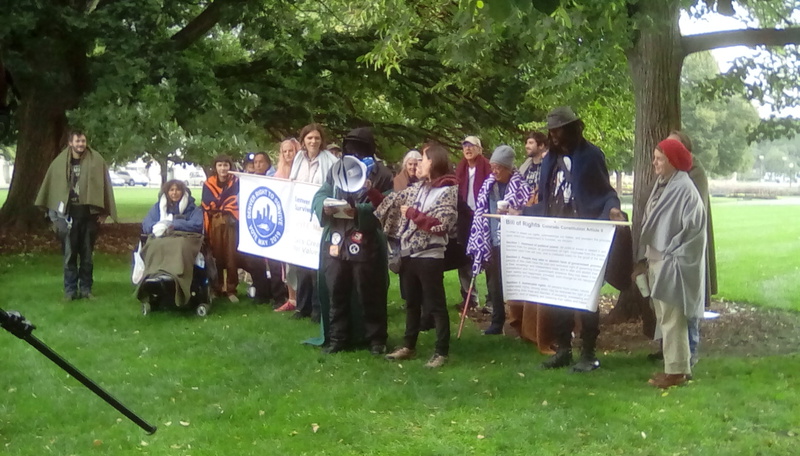 On November 21st, we, the undersigned organizations, sent you, Mayor Hancock, a letter demanding immediate action be taken to protect the rights, dignity, and survival of people without housing in Denver by stopping the sweeps, stopping taking people’s blankets and property, and providing land and legal variance for tent dwelling for people without homes. Weeks later we have received no reply from the Mayor’s office whatsoever. We sent this letter seeking immediate action from the Mayor on these steps, not to send a call into a void. People’s lives are at risk and the lack of response indicates the Mayor’s office is not taking this seriously. In order to move forward the immediate steps called for, we are providing further clarity on the exact laws and processes tied to these action steps. Provide land and legal variance for tent dwelling for people without homes – Adopt and modify one of the countless models for designated and non-designated tent and vehicle dwelling around the country. See Seattle’s Transitional Encampment zoning law (attached) which creates legal code for tent and vehicle dwelling. And see Indianapolis’ Encampment response policy (attached) which requires encampment residents be given an open and attainable housing option before individuals can be swept. (These codes and policies can be immediately implemented by the Mayor under a “state of emergency” as similarly done in other US cities). The past 5 weeks of police sweeps across the city of Denver, directed by you Mayor Hancock, can be stopped just as easily as they were started. Until there is actual attainable low-income housing enough to meet the need of the thousands of people, with numbers growing each day, who can’t afford Denver’s rents, people will be living on the streets of Denver. Shelters are not an option for hundreds of people. The city must hear the cry of people without housing, let people cover themselves from the winter weather, and be seen. How Can I Help with the “March for Homes, Rights, and Dignity”? to come and why you will be there to stand up for our survival. social media and email. Send it to us to share too! ● Make a model house or tiny home that you can carry in the march. one you can give out to someone in need at the end of the march. ● Bring water bottles or snacks for people on the march. ● Bring food to City Hall at the end of the march. what ways you can help! We want housing. Or a tiny home would at least be nice. Or even just a tent for now. At the very least let me use my blanket. Two weeks after the community sent a letter to the Mayor and held an action at City Hall demanding an end to the insane sweeps, there has not even been a reply from the Mayor. Sweeps are still rampant across the city, under the direction of Mayor Hancock. Police, and now police cameras, are stationed at the Triangle and other areas people gather to survive – waking people up and moving them along the minute they lay down to sleep. Many people have been pushed from place to place around the city every day. People are losing opportunities for housing due to case managers being unable to find folks scattered in the sweeps. People are freezing with no protection from the cold. Lives are at risk. This insanity and inhumanity must end. The community will again join in action on Saturday December 15th 2018 unless our demands are met. We will march from the Triangle, where countless people have lived without housing for years until the City sweeps everyone out, to City Hall to bring the cry of the people to the Mayor. We will carry models of housing, tiny homes, tents, and blankets to represent the housing we want most and basic protection we are asking we at least be given now in our immediate emergency need for survival and dignity. Provide land and legal variance for tent dwelling for people without homes – Adopt and modify one of the countless models for designated and non-designated tent and vehicle dwelling around the country. See Seattle’s Transitional Encampment zoning law which creates legal code for tent and vehicle dwelling. And see Indianapolis’ Encampment response policy which requires encampment residents be given an open and attainable housing option before individuals can be swept. (These codes and policies can be immediately implemented by the Mayor under a “state of emergency” as similarly done in other US cities). Join us Saturday December 15th 10am at Lawrence and Park Ave. March for homes, rights, and dignity. Let’s just start with the math. Denver has at least 3,445 people experiencing homelessness (a known undercount) and not quite 2,000 spaces at shelters. At least 609 of these people are “unsheltered” (meaning staying outside). 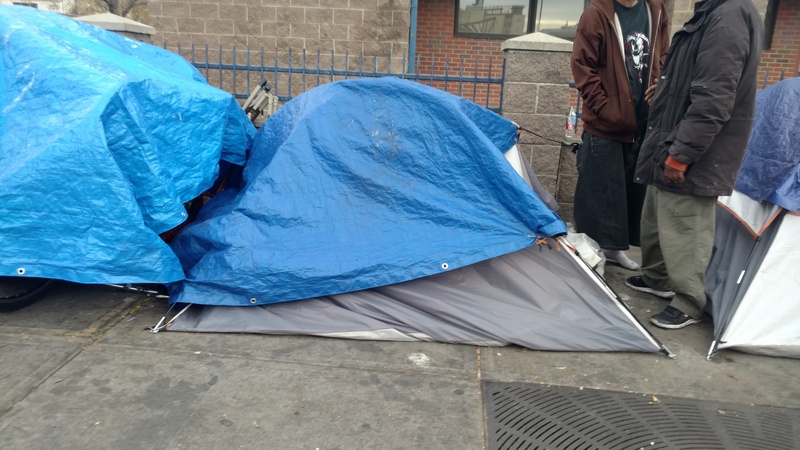 The city claims there is on average, 100 to 150 shelter spaces that go unused each night. Even given this massive undercount of people experiencing homelessness, and this liberal estimate of open shelters spaces, 609 people do not fit in 150 spaces. The math doesn’t add up. Now let’s go beyond math to the human elements of this situation. People without housing are not bodies to be put in spaces in a shelter building, but rather human beings who have lives. The reality of life and dynamics in shelters are such that they are not a viable, healthy, safe, or possible options for many people. Accordingly, hundreds of people without housing WILL BE living outside creating their own shelter in Denver this winter. We simply ask the City of Denver to give back the shelter people create for themselves to survive – both the physical tarps/tents/blankets/ect, and the right to use this shelter to survive. Today, October 30, the City sent out masses of police to continue the attempt to sweep homeless people out of sight. After being swept yesterday from the triangle area by Lawrence and Broadway, the 200 plus homeless people living in this area moved to near by surrounding blocks and farther away by the river and other such areas. Today police came at 7am and before to tell people they where violating the survival ban and must move. Now these same hundreds of homeless people are scattered about the city pushing carts trying to find somewhere to rest. All this as snow is about to fall. The City’s two face lie must stop. While they say they are trying to connect people with shelter they take people’s shelter away. While they say they are trying to help people be safe, they take people’s property and tell them they can’t cover themselves in the snow. While they tell people to get a job, they make it impossible to work while they sweep your property on the streets. This insanity must end. For the sake of people’s humanity and survival. Today, Monday October 29th 2018, hundreds of homeless people – who by definition have no home of their own to live – were swept from the blocks of Lawrence, Park Ave, Broadway, and Arapahoe where they have been gathered together in tents for safety for months. Homeless people have been allowed to live in tents and tarps in this area for months with only scattered police enforcement of the survival ban. Now, out of nowhere, the City suddenly started sweeping people out with no notices. The Cities attempt to act like this is about health and safety flips reality on its head. Sweeping people out of their tents, place, and community puts peoples health and safety at risk, not the other way around. Now hundreds of homeless people are wondering the streets trying to figure out where to stay and with what they will protect themselves from the coming snow. Just in the last hour 8 people who were swept from these blocks have come to get tents from our Denver Homeless Out Loud office (we are almost out now so please donate more tents!). 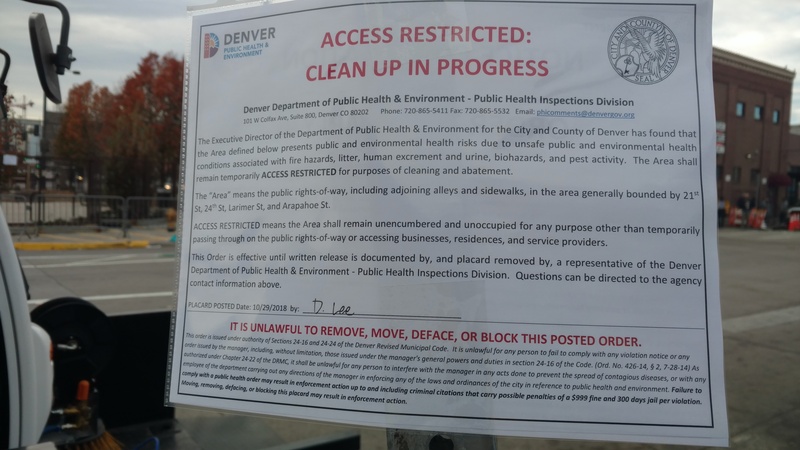 This takes place only a week after the Denver Elections Division announced the Denver Right to Survive Initiative, which would over turn the survival ban and end these sweeps, has made the ballot for May 2019. 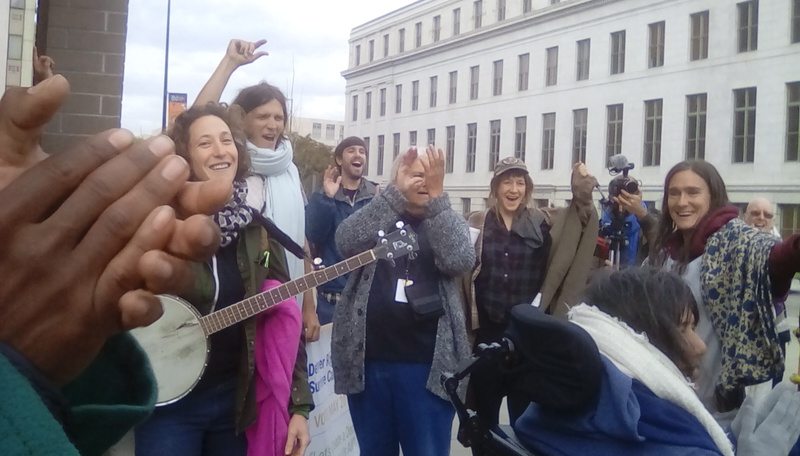 Denver Right to Survive Initiative Makes Ballot for May 2019!!! On Monday October 22nd 2018 the Denver Elections Division announced that the Denver Right to Survive Initiative has gathered 7,026 valid Denver registered voter signatures, far over enough to qualify for the ballot. 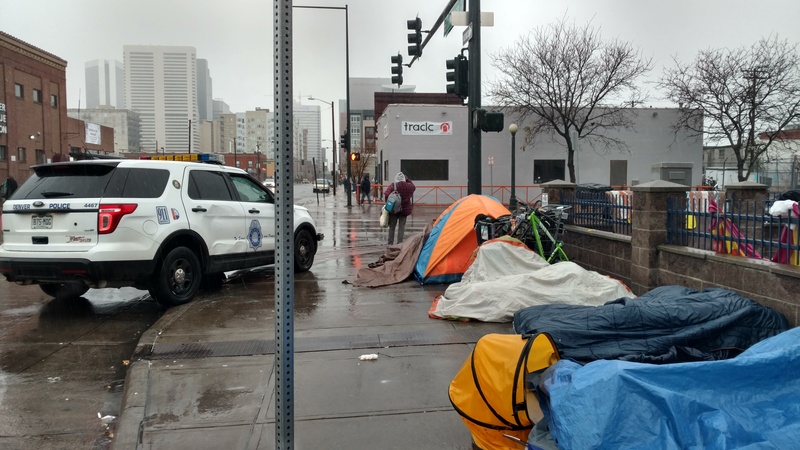 The Denver Elections Division spent the last three weeks reviewing the over 9000 signatures community members gathered from voters calling for support of these basic rights and protections for homeless people trying to survive. To kick off the campaign after this announcement, the Denver Right to Survive Initiative committee will be holding a Picnic Potluck on Saturday October 27th at 12noon at Civic Center Park near the City and County building. All are invited to bring a blanket to sit on for the picnic — the very act of sitting on this blanket is currently a violation of the “camping ban” this initiative will overturn. All are also invited to bring food for the potluck to share. There will be speakers, sign making, and ways to plug into the Denver Right to Survive Campaign. This initiative protects the basic human rights of people to sleep, sit, use cover, sleep in their vehicle, share food, and have privacy of their property. This initiative enables people without housing to survive in Denver when they have nowhere to live but the streets.